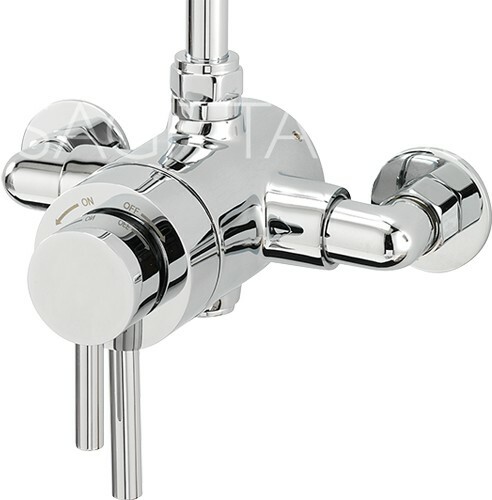 Sagittarius > Ergo Exposed Shower Valve With Slide Rail Kit (Chrome). Ergo exposed shower valve in chrome with slide rail kit. Separate controls for temperature and water flow. Deluxe slide rail with handset and hose. Fully adjustable to fit existing holes. Suitable for combination boilers, gravity fed systems, mains water systems. Solid brass construction with chrome finish. Shower valve with adjustable pipe centres: 130mm to 160mm. Connections: standard 15mm (1/2") inlet. Suitable for high water pressures. 10 Year guarantee: Sagittarius guarantee this shower pack for 10 years. Sagittarius taps and showers feel that their products should perform as well as they look. All Sagittarius products are manufactured to the highest standards, which include BS5412, BS1010, TMV2 & TMV3. Most products incorporate WRAS approved components. Such is their commitment to quality and customer peace of mind.